TIP DIAMETER 3.8 mm PROCESSING VOLUME 300 µl - 15 ml INTENSITY .. TIP DIAMETER 3.2 mm PROCESSING VOLUME 250 µl - 10 ml INTENSITY .. TIP DIAMETER 4.8 mm PROCESSING VOLUME 750 µl - 25 ml INTENSITY .. 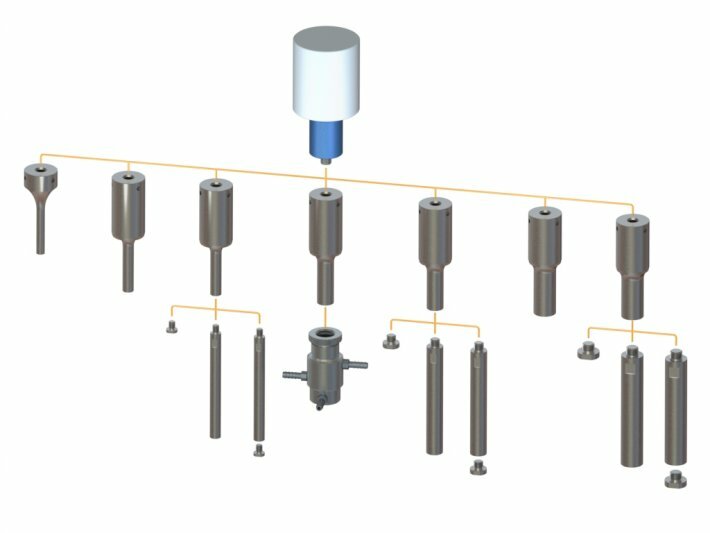 The Cup Tip offers non-contact homogenization of small volume samples in a high intensity ultrasonic..
Used with the 250 ml Cup Tip, it suspends 8 Microtubes within the Cup Tip for processing. .. 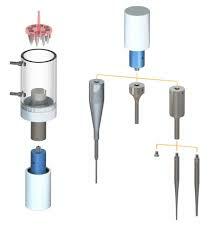 TIP DIAMETER9.5 mmPROCESSING VOLUME5 ml - 200 mlINTENSITYHIGHAMPLITUDE (MICRONS)160AMPLITUDE CONTROL.. Tapped Tips are a 2 piece design comprised of the Body and Flat Tip, both manufactured from a titani.. TIP DIAMETER 12.7mm PROCESSING VOLUME 10 ml - 300 ml INTENSITY .. TIP DIAMETER19.1mmPROCESSING VOLUME25ml - 600 mlINTENSITYMEDIUMAMPLITUDE (MICRONS)70AMPLITUDE CONTRO.. TIP DIAMETER25.4 mmPROCESSING VOLUME50 ml - 2000 mlINTENSITYLOWAMPLITUDE (MICRONS)40AMPLITUDE CONTRO.. Tapped Tips and Extender Tips use replaceable Flat Tips. During normal use, the radiating face or fl.. The Continuous Flow Chamber in conjunction with the 19.1mm Solid Titanium Tip, allows the continuous..